Underwater archaeologists from the city of Nice, along with their colleagues from the institute of underwater and submarine archeology in Nice, discovered the bomb. The explosive, 1.10 meters long, was discovered by chance in the morning on 4th May. It contains 130 kilos of explosives! Now comes the tricky problem of destroying it. An archaeologist discovered the device in the morning, in front of Nice’s Promenade des Anglais, twelve meters deep, between Castel Beach and Opera Beach. A weapon of imposing size: 1.10 m long and forty centimeters in diameter. It may date from the Second World War. “The diver had the good sense not to touch it and warned us immediately via semaphore, from Saint-Jean-Cap-Ferrat,” said the Maritime Prefect of Toulon last night. The man had provided the GPS coordinates of the explosive. A powerful monster, sleeping only 50 meters from the shore! 250 kilograms, according to our sources, with an estimated 130 kilos of explosives. A figure yet unconfirmed last night by the Maritime Prefect, as it is still under investigation. “This ammunition probably lay there for a long time, buried, until it was uncovered by the sea’s movement,” said a specialist. The firefighters and the maritime gendarmerie went to the area with their nautical vessels. The municipal police evacuated a small part of the public beach. Throughout the night, the National Police monitored the scene. Over several hours, Navy divers, coming from Toulon, tried to evaluate the situation. The presence of such a device, only a few dozen meters from Old Nice, is a headache for the authorities. “Either it is recoverable and movable, and it will be removed and destroyed by an explosive charge, or it is not possible because of the dangers involved. In this case, a security perimeter will be set up in order to destroy it,” said the Maritime Prefect. In the light of the latest estimations of the bomb’s power, evacuating the Cours Saleya as a precaution may be necessary. But, for now, no decision has been made. The safety perimeter, on the beach, remains in force as well as a radius of one hundred meters for all nautical activities. “The means to treat it will be the subject of a precise study in the next few days,” said the Maritime Prefect in the evening. A coordination meeting was held between State services, the Department and the Maritime Prefecture of Toulon. 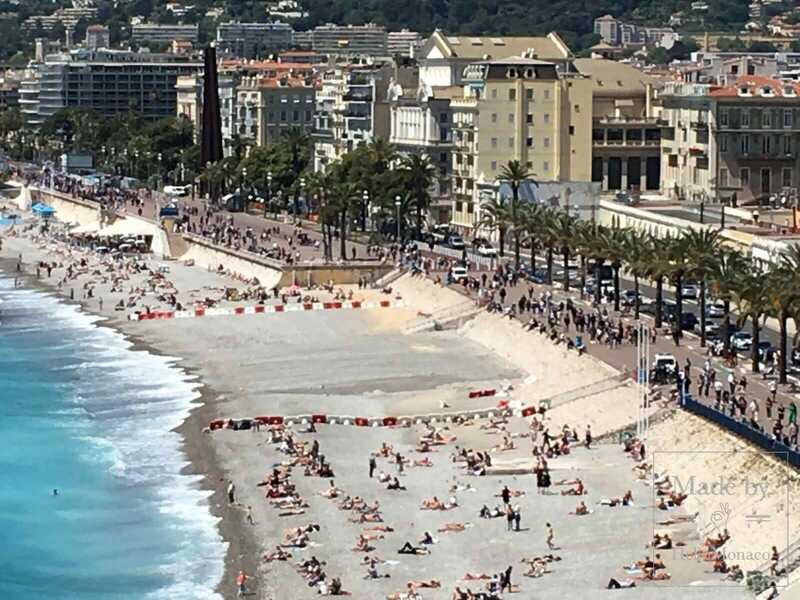 It was finally decided to move the 250 kg bomb, discovered this Thursday 50 meters off the public beach of Castel, along the Promenade des Anglais in Nice; an extremely delicate operation that cannot take place until next week. “Everybody agreed that doing it this weekend was anything but a good idea,” explained the Maritime Prefecture of Toulon. “Firstly, for meteorological reasons this Saturday, then because of the elections on Sunday.” The forces will be busy enough securing the polling stations. There is no need to put them to work. The operation of neutralizing this bomb from the Second World War, containing the equivalent of 150 kg of TNT, will require setting up a wide perimeter of security. Even if the device has not yet been dealt with, it seems very likely that traffic will be prohibited on the États-Unisquay. Navy operations could also justify the evacuation and closure of shops on Saleya. Finally, air traffic is also likely to be impacted. The Maritime Prefecture confirms that discussions are under way with the General Directorate of Civil Aviation (DGAC) to determine a tow point “sufficiently far from the climb and descent space of airplanes “which coincides exactly where the bomb is located at the moment. However, the bomb disposal technicians will not be able to tow this potentially unstable explosive device indefinitely. The type of ammunition, dating from the Second World War, was specified. It is an ANM-64 aircraft bomb that contains the equivalent of 150 kg of TNT. If it did not explode, it was most likely engaged before it was dropped. This could make it all the more unstable when handling it. There is little risk that it will explode spontaneously after 70 years. On the other hand, bomb disposal technicians will have to dig under the device in order to pass cables under it and secure it to an inflatable buoy. The critical phase will then take place, during which the bomb will be lifted from the bottom of the Baie des Anges before being towed further offshore to a detonation place which remains to be determined. The bomb disposal technicians will then detonate it. Maybe Wednesday or next Thursday, weather permitting. Access to the public beach of Castel is forbidden until the bomb is towed to a safe place and detonated. Undoubtedly, it is an explosive dropped during the raid conducted on 26 May1944. A discovery which, in fact, owes nothing to chance. The dive was part of an underwater excavation campaign that began two weeks ago. “We launched an exploration program in the Baie des Anges initiated by the underwater archeology department of the city of Nice, which is unique in France, in partnership with the Ministry of Culture,” said Stéphane Morabito, Heritage Conservation Officer at the Métropole. Under this program, 32 hectares of coastline have been meticulously mapped using sonar. “This allowed us to duplicate the topography of the depths and detect 150 to 200 targets that may be of archaeological interest,” said Stéphane Morabito, “The location of the bomb was one of those targets. When the divers explored it on Thursday, even if they were not sure of their discovery, they took no risk and immediately alerted the Cross-Med, as procedure requires. The rest is known. The origin of the ammunition is still a mystery. Jean-Marc Giaume, deputy for Historical Heritage of the City of Nice, puts forward two possible paths which both lead to the same tragic date. The bombing on 26 May, 1944 by the Allies, which will be commemorated in a few days, in particular the 313 dead and 150 missing. “The objective was to destroy the railway infrastructure and in particular the Saint-Roch depot,” recalls the elected Jean-Marc Giaume. The explosive, recovered 73 years later, could be one of the bombs dropped that day from a very high altitude and almost blindly. Unless it belonged to the American B-24, who, hit by the German DCA during the attack, would have dropped its cargo at sea to alleviate it before attempting to rejoin its base. “There is little chance that we will have the bravery,” breathes archaeologist Stéphane Morabito. To find out the origin of the bomb exactly would require manipulating it in the hopes of discovering a serial number. This, given its very unstable nature, is obviously out of the question. The bomb disposal technicians of Toulon will give the bomb a completely different fate.